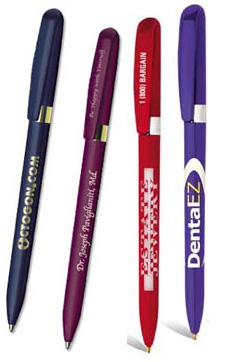 • The colorful, stylish, smooth-twisting ballpoint pen. • 10 barrel colors and a silver or gold-plated ring. • Choose your colors with BIC Color Connection. Imprint area for this pen: 2" x 3/4"
These take 6 business days in production, plus 2-5 days shipping time. Quantity 300 - Now .89 ea. ($267.00) Reg. 1.04 ea. Quantity 500 - NOW .79 ea. ($395.00) Reg. .98 ea. Quantity 1000 - NOW .75 ea. ($750.00) Reg. .94 ea. Quantity 2500 - NOW .69 ea. ($1725.00) Reg. .82 ea. and change that to the quantity you would like. For larger quantity pricing, please email us.